Growing up as an overweight kid has to be one of the toughest things to endure. It was particularly bad for me during my elementary and junior high school days. I never had any brand name clothing, typically had one pair of sneakers to last me the entire school year, and was always one of, if not the fattest, kid(s) in my class. I laughed off the teasing and cruel jokes to mask my sadness. I can vividly recall nights where I would cry to myself. My mother was aware of the weight difficulties I faced and she did her best to comfort me. Often I heard, “Christian, do not worry about them. You are handsome. You are just a little husky.” I appreciate the effort she made, and parents that do the same for children that battle with weight, however, it’s often for naught. It is near impossible to convince a young person that everything will be just fine. This is likely because they, like myself, likely are experiencing body dysmorphia before they can begin to understand how to cope with it. Body dysmorphia is essentially when an individual feels so uncomfortable with their appearance that they will take measures to hide certain parts of their body to avoid people seeing them. While others possess the ability to find beauty in those with body dysmorphia, those who suffer from it do not see it in themselves. For some, as you get older you get to understand your body type and find a coping mechanism for people poking fun at your size. I optioned for joking on myself first (which always made everyone laugh) before anyone else could. However, this did not cure the disorder. I practiced sucking in my gut whenever I was around others. During my first couple years of college, my weight constantly fluctuated because I was so obsessed with being smaller. I would work out or play basketball, but then would gorge out at the dining hall on campus. I loved food so much that it seemed like an impossible task to lose weight. Fast forward to the present day, I am finally at peace and happy about the way I look. It took me 29 years to understand that everyone has flaws and blemishes that they wish to change. This foundational way of thinking led me to the body positivity (BOPO) movement. To me, the BOPO movement is just about loving yourself in all facets, not just aesthetically. BOPO also means to support others who may or may not feel comfortable with their bodies. It indirectly led me to venture into the realm of brawn/plus/curve modeling. I have always had an internal passion for fashion, including shopping and putting together looks that I love. Last year, I discovered that ASOS (an online fashion and cosmetic retailer based in the United Kingdom) had a “Plus” section on their website. This opened the door for me to fully explore fashion as they offered clothes in my size that were stylish as well. This beat the alternative of most big and tall stores, which have limited sizes and dull options. 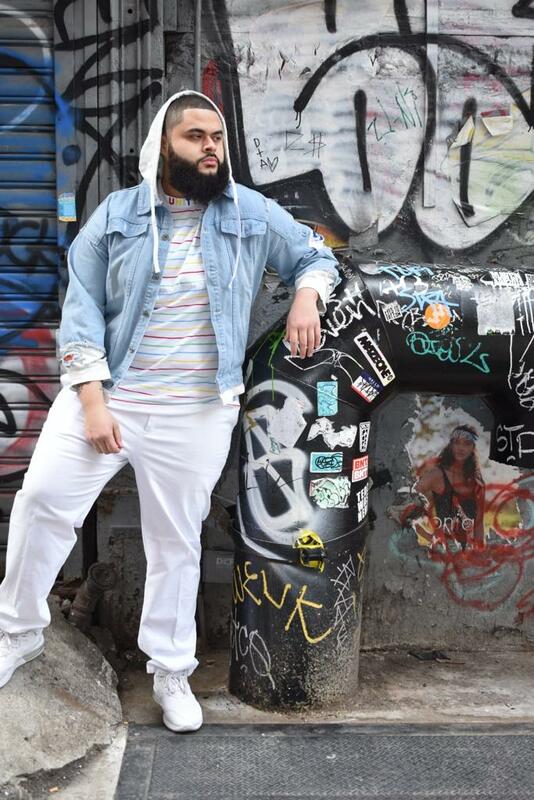 I weighed 322 lbs then and thought to myself, “I’m good now because I can find clothes that are my size.” Further, the Plus male models on ASOS’ site spurred the thought that, it’d be cool to take some photos of myself wearing these clothes. I decided then that I wanted to do a photoshoot. I had no intentions of being a famous brawn/plus male model. I had no intentions of being featured on any online stores or websites. I honestly just wanted to take some professional photos and post them on Instagram. We plus-sized individuals are here to say that, "We are here to stay. We exist in this realm too. Deal with it." Recently, I met up with my friend Sandy who agreed to take the photos of me. We went to the DUMBO area of Brooklyn in 30 degree weather to do the photoshoot. She was super patient and supportive as the shoot took five hours. The next day, Sandy showed me the footage, which amassed 15 different looks (thank you, Sandy)!. She recommended that I start looking for other plus male models for inspiration and that I tag all the brands I’m wearing in my photos to maximize exposure. Sandy has her own successful lifestyle blog (www.curvenvy.com) that supports curves in fashion. My instagram account (@beardedchrisperez) quickly gained a decent amount of traction in a short period of time. I became even more interested in the world of brawn/plus male modeling. Likes and followers aside, I have met some truly supportive and influential people. In specific, Brandon, Jay, Ady, my whole XXL Society family, and every other person who has given me love and encouragement. The Curvy Art + Fashion Experience event I attended solidified my love for this industry. I was mesmerized by all the love, positivity, and great ensembles put together by the show’s curators and designers. Nervous as heck, I came dressed to the nines in my royal blue outfit. I received so much love and support it was breathtaking. 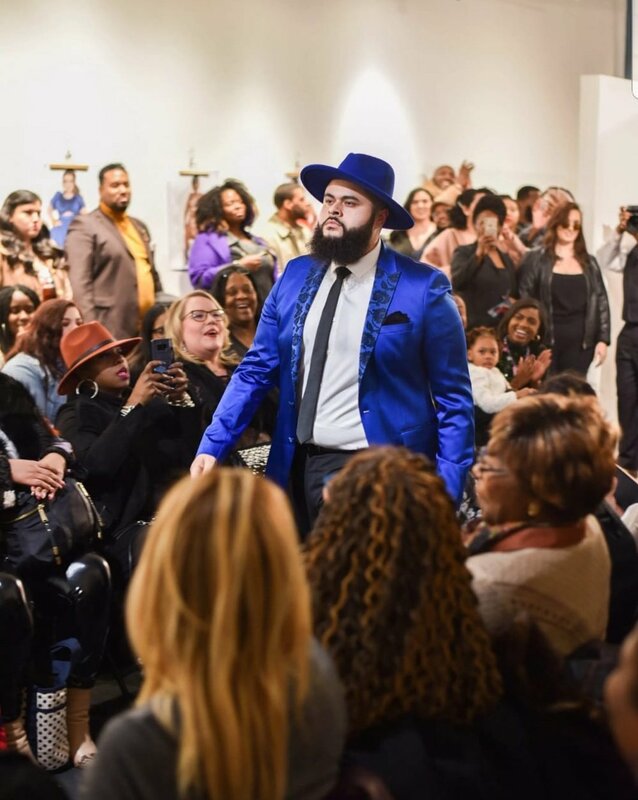 I even was given the opportunity to walk the runway, an impromptu moment, generated by a supportive community during one of the show’s intermissions. It was a fantastic experience with energy and passion from others that made for a memorable night. Still giddy about that entire experience, I am hungry for more photoshoots and shows. So here I am, loving every inch of my body. Currently, I am at 280 lbs (thanks to my Coach Norman and his beastly boxing training), not because of body dysmorphia, but simply because I just wanted to be a little bit healthier. This is not to say that everyone should stay the same path as me. Everyone is different. Everyone has a different shape. Everyone’s path should be their own. I am here, however to say that I will always love and support each and every person. I do not know where the world of brawn/plus/curve fashion will take me, but I know that this belief will never change. Much love and support to everyone!